The new Kobo Arc 7 is the spiritual successor of the original Arc tablet released last year. The big question is, should you upgrade? The only upsides of the new tablet is the quad-core processor and most other aspects such as resolution and memory have been diminished. Today, we put the two head to head to give you a sense of the UI, eBook experience, audio/video performance and our rating. The Kobo Arc 7 features a seven-inch capacitive LCD touchscreen with a resolution of 1024×600 pixels. Kobo had to sacrifice screen quality to drive down the price, but if you are buying this just to read eBooks, magazines, and newspapers, it should be more than sufficient. Underneath the hood is a Quad-Core, 1.2 GHz. processor. There are also 1 GB of RAM and 8 GB of internal memory, you can enhance the memory up to 32 GB via the Micro SD. 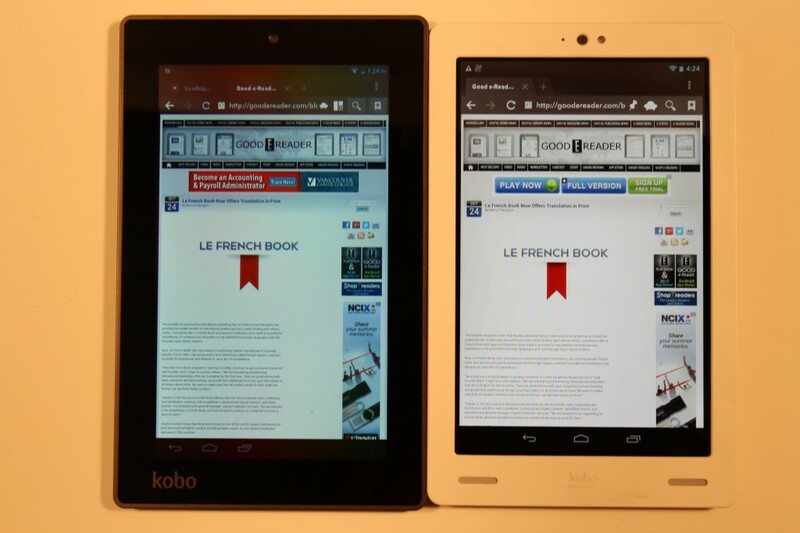 The 2012 Kobo Arc features a seven inch HD display with a resolution of 1280×800 pixels and 215 PPI. It has a front facing 1.3 MP web cam, which trounces they newer version which only has .03 MP. Underneath the hood is a Texas Instruments OMAP 4470 1.5 GHZ dual core processor and 1 GB of RAM. You can house 16 GB of space of data but there is no expandable memory in this model. So what are the big differences? The older version has more memory, better resolution, front facing stereo speakers, a better camera. The newer model has a faster processor, new UI and plenty of software enhancements. Check out our head to head comparison below and weigh in yourselves.